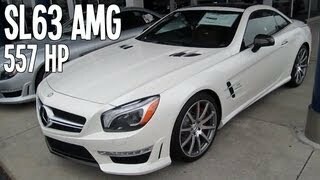 German Auto maker Mercedes Benz is looking to add a new model to the highly popular performance focused SL series with the new 2013 Mercedes-Benz SL63 AMG. The next generation SL63 AMG is expected to offer improved fuel efficiency and power output due to the incorporation of advanced technologies and equipment. Mercedes-Benz has fitted the SL63 AMG with a powerful 5.5 liter V8 engine coupled to twin turbochargers which can generate a power output of 530 HP and torque of 590 lb-ft for the wheels. For customers who want more power there is the option to install the AMG performance package that improves the engine output by 27 HP and torque by almost 74 lb-ft. 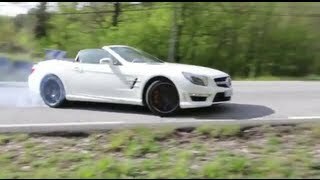 The SL63 AMG can attain a maximum speed of 186 miles per hour and takes only 4.3 seconds to go from 0 to 100 kilometers per hour. Mercedes has installed many advanced components like, ECO start/stop system, variable timing valves, twin turbochargers and spray-guided fuel injection system to improve the power and fuel efficiency of the V8 engine. Another major plus point of the 2013 SL63 AMG is the carbon fiber &aluminium body framework that has helped to reduce the weight by almost 275 pounds when compared to the previous models. The transmission of power from the engine to the wheels is controlled by the innovative AMG SPEEDSHIFT MCT 7-speed gearbox which provides the benefits of both manual and automatic transmission. The MCT has a cutting-edge start-up clutch that responds dynamically without any slip. The 2013 SL63 AMG fitted with the latest advanced components thus provides 30 percent more mileage than the previous models. The car exterior has received minor changes like a new radiator grille and V8 BITURBO logo on the vent grilles. The Mercedes-Benz S63 AMG will compete for the market share with BMW M6, Jaguar XKR-S and Maserati GranTurismo convertible when it comes out. The stage is set for the new Mercedes-Benz SL 63 AMG. Planned to follow the U.S. debut of the new-generation SL550 roadster later this year, the latest version of the high-performance SL model features more power, lighter weight and an approximately 30 percent better gas mileage. Thanks to its aluminum bodyshell (similar to the SLS AMG super sports car), the weight of the new SL63 AMG has been reduced by 275 pounds. With a curb weight of 4,059 pounds (estimated) and 530 horsepower, the new model boasts unparalleled performance and an extraordinary driving experience. Performance is also enhanced with a winning combination: AMG active suspension (based on ABC Active Body Control), new AMG speed-sensitive sports steering, the AMG high-performance compound brake system and the AMG SPEEDSHIFT MCT 7-speed sports transmission. Topping off this impressive package is an enticing mix of stylish design, extensive standard equipment and a high safety level. Ola Källenius, CEO at Mercedes-AMG GmbH: "The new SL 63 AMG is yet another masterpiece from Mercedes-AMG. 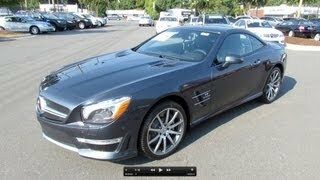 Be it driving dynamics, lightweight construction or efficiency – the SL 63 AMG represents a giant leap forward. Following on from the SLS AMG Roadster and the SLK 55 AMG, it now makes our unrivalled roadster family practically complete." For the first time, the SL 63 AMG is available with a choice of two power levels. Normally, the AMG 5.5-liter twin-turbocharged "biturbo" V8 delivers 530 horsepower and 590 lb.-ft. of torque. With the optional AMG Performance Package, these figures rise to 557 hp and 664 lb-ft respectively. The result is acceleration from 0 to 60 mph in 4.2 seconds and top speed is electronically limited to 186 mph with the AMG Performance package, and thanks to its new direct-injection V8 engine, gas mileage is a full 30 percent (estimated) better than the outgoing model. The new V8 powerplant in the SL63 AMG (identified internally as the M157) features a combination of innovative high-tech components for high power output and low fuel consumption. In addition to spray-guided direct injection, the engine boasts an all-aluminum block, twin turbochargers, four valves per cylinder with variable valve timing, air/water intercooling, alternator management and an ECO stop/start system. The weight-optimized AMG sports exhaust system with a pair of twin tailpipes produces a distinctive engine sound. Intelligent lightweight construction is one of the major factors behind the impressive fuel mileage figures of the SL 63 AMG. Based on a lightweight aluminum bodyshell (similar to the SLS AMG super sports car), this design not only delivers significant weight savings but it also greatly enhances body rigidity, and as a result, safety and comfort as well. Intelligent lightweight construction also means that components have been optimized for their specific purpose. For example, high-strength steel tubes are integrated into the aluminum roof pillars for safety reasons, while several types of processing are used for the aluminum parts – permanent mold castings or vacuum die castings are processed into extruded sections or used as sheet aluminum with varying wall thicknesses. The result is high rigidity, high safety and improved vibration characteristics. For the cover behind the fuel tank, designers use magnesium, which is lighter than aluminum. Even the trunk lid helps to trim weight further. For the first time on a mass- produced car, its inner frame is made from a lightweight carbon-fiber composite, which is bonded to a plastic outer shell, saving 11 pounds compared to a conventional trunk lid. Overall, a raft of innovative lightweight-design measures means the new SL 63 AMG is 275 pounds lighter than the model it replaces. Lightweight-design measures are not just limited to the body of the SL 63 AMG. The steering knuckles and suspension arms on the front suspension and almost all of the multi-link independent rear suspension parts are made of aluminium. The reduced unsprung weight enhances both agility and spring and shock response. The new SL 63 AMG is equipped with an enhanced version of the AMG sports suspension that's based on the Mercedes-Benz ABC active suspension. During its design, development and testing phases, the focus was clearly on driving dynamics and performance. At the push of a button, the driver can select "Sport" for reduced body roll and firm shock damping or "Comfort" for a high level of comfort on long trips. For greater agility and faster cornering speeds, the SL 63 AMG has more negative camber all round and fully revised elastokinematics. The new SL63 AMG is equipped with a new, electro-mechanical AMG speed- sensitive sports steering for agile cornering and exceptionally good feedback during high-performance driving. The steering has a faster, constant ratio and variable power assistance, which adjusts automatically to the suspension settings. Standard equipment also includes three-stage ESP® – its "SPORT Handling" mode for accomplished drivers is exclusive to AMG. Options available from the AMG Performance Studio include an AMG rear axle differential lock and AMG performance suspension. Providing the direct feedback of a manual transmission with the total convenience of an automatic, the seven-speed MCT with AMG SPEEDSHIFT features an innovative start-up clutch, which runs in an oil bath and replaces a conventional torque converter. Thanks to its low rotational mass, the start-up clutch helps the transmission respond instantaneously and dynamically with no slip. Fitted with seven speeds, four shift modes and a double-clutching function, the MCT transmission offers impressive versatility and even faster shift times. With four drive modes: "C" (Controlled Efficiency), "S" (Sport), "S+" (Sport plus) and "M" (Manual), the transmission provides customized shift control for maximum driving pleasure, and does so with no interruption of power. In the "C"mode, smooth shifts coupled with a "soft" accelerator response are set up for silky smooth power transfer. Also active in the "C" mode, the ECO start/stop function turns off the engine when the car is at a standstill. A newly developed AMG high-performance compound brake system features 15.3-inch compound discs with six-piston fixed calipers at the front and 14.2- inch integral discs with single-piston floating calipers at the rear. An electric parking brake is standard, while options include ceramic high- performance compound brakes (similar to the SLS AMG) and red-painted calipers that identify the AMG Performance package. The SL 63 AMG leaves the factory fitted with five-twin-spoke AMG light-alloy wheels painted high-gloss titanium grey, and are shod with 255/35 R 19 front and 285/30 R 19 rear tires. Optional multi-spoke AMG forged wheels from the AMG Performance Studio (also available in matte black including a rim flange with a high-sheen finish) with 255/35 R 19 front and 285/30 R 20 rear tires help reduce unsprung weight. Distinctive AMG bodystyling includes a front apron with a large air dam, AMG- specific LED daytime running lamps and a lower cross strut in silver chrome. Among its eye-catching features are a new AMG radiator grille with a double louver in silver chrome, side sill panels and "V8 BITURBO" logos on the vent grilles with fins in silver chrome. At the rear, an AMG spoiler lip, two chromed twin tailpipes of the AMG sports exhaust and a diffuser-style rear apron with a body-colored insert draw the design to a fitting conclusion. The sixth-generation SL features a retractable hardtop that can transform the quiet, weather-tight coupe into a top-down roadster in under 20 seconds. The new SL has two versions to choose from: a glass roof or the unique panoramic roof with MAGIC SKY CONTROL, which can be switched from light to dark tinting at the push of a button. Inspired by the SLS AMG, the SL 63 AMG interior offers a feast for all the senses: four air vents styled like jet engines, an E-SELECT lever and AMG DRIVE UNIT are all reminiscent of the super sports car. Standard equipment includes AMG sports seats in single-tone or two-tone nappa leather with a unique seat upholstery design and AMG badges in the seat backrests, a multicontour function and seat heating as well as AMG carbon-fiber trim, AMG illuminated door sill panels, ambient lighting and an IWC-design analogue clock. One of the stand-out details on the AMG performance steering wheel is an AMG logo in the lower metal insert. A sporty AMG instrument cluster provides a wealth of information and includes a TFT colour monitor, AMG start- up display, AMG main menu and RACETIMER. Outstanding material quality and high-caliber workmanship underline the attention to detail paid by the Mercedes and AMG experts. A crash-optimized aluminum body structure, standard-fit PRE-SAFE® and assistance systems on a par with the flagship S-Class make the SL the world's safest roadster. The rigid aluminum bodyshell forms a strong occupant compartment with defined deformation zones at the front and rear. If the vehicle rolls over, A-pillars made from a steel-aluminum material mix and two automatic roll-over bars help to protect the occupants. Restraint systems, including two-stage driver and passenger airbags, have been further enhanced. Headbags cover the side head-impact area, and thorax air bags in the backrests can protect the upper body in the event of a side impact. Other new standard features for the SL include Mercedes-developed NECK-PRO crash-responsive head restraints and a front end with a large, yielding impact area and an active front hood to help protect pedestrians.